Many of us have one or two postures that are relatively simple, yet due to our individual anatomy, it seems ‘impossible’ to practice with any comfort whatsoever…. Take Gomukhasana for example: this posture looks quite accessible from the outside, but it’s often incredibly uncomfortable and even out of the question for a lot of people, often simply because of a combination between muscular tension in the abductors and lower back, and bony restrictions in the hips – in other words, ‘the way you’re made’…. Virabhadrasana 1 is also a common posture that may seem perfectly comfortable for some, yet for others – due largely to the anatomy of the hips, pelvis and legs – it provokes a ‘twisting’ sensation in the back knee, which can easily lead to injury. Malasana can be another asana which feels like home for some, and hell for others – similarly, eka pada raj kapotasana or ‘pigeon pose’, which again could be down to muscular tension or simply the shape of our bodies. Urdvha Dhanurasana could well be one of those postures in which it seems like there’s no logical reason as to why your body just ‘wont do it’…. And here we’ll explore why it may or may not be accessible for certain bodies. The shoulder girdle is quite complex compared to the structure of the hips and pelvic bowl; although these two parts of the body share similarities in their shape and function, the joints of the hip tend to be more stable and ‘stronger’, and the shoulders are infact the most mobile joints of the skeleton. While it’s important to realise that even though handstands and arm balances are fun and help to build a lot of strength – our hands are not our feet, and therefore if we keep using them to support our whole body weight, eventually something may become injured. Moreover, because of our daily habits of slouching, sitting and slumping and then attempting to counteract all of the sitting with crunches, sit-ups and push-ups … we end up with perpetually rounded shoulders, which can lead to ‘tight’ pectoral muscles (chest muscles) and weaker muscles of the back, particularly the trapezius, rhomboids and muscles surrounding the scapula, which all help to stabilise the vulnerable shoulder joints. When we focus on back-bending in a Yoga class, there’s often a lot of focus on preparing the spine to bend-backwards, but while this is indeed vital, it doesn’t always help to prepare the body enough for postures like urdhva dhanurasana. Coming back to referencing our ‘daily habits’ – slouching, sitting and slumping – all of this can lead to habitually contracted hip flexors, and ‘stiffness’ in the upper back. When one part of the body is chronically ‘tight’, another part of the body will often compensate by becoming slightly hyper-mobile. When the hips and upper back are ‘tight’, the lower back (lumbar spine) and neck are often the two places that become hypermobile. Because of this hyper-mobility, most of our back-bending in a Yoga posture occurs in the lower back and neck, which only serves to make these areas even more mobile while ignoring the two parts of the body which could really help create a safer and more effective back bend if they were ‘opened’ properly. The point of this is to realise that if there’s a restriction in your backbending posture, or any other posture for that matter – the task isn’t to isolate certain muscle groups and focus on making them stronger or more flexible, it’s about treating the body as whole and integrated, finding the balance between stability and mobility, and figuring out how to allow every part of the body to be involved with every posture. This version of ashta chandrasana serves as gentle preparation for urdhva dhanurasana, and it works on opening the front of the body, while gently contracting the back, and bringing the arms into a position which could give you a clue as to why you find ‘full wheel’ accessible or difficult. One of the obstacles on the road to urdhva dhanurasana is often restriction within the shoulder girdle, specifically the glenohumeral joint (the ball and socket joint of the shoulder). The shape of our shoulder girdle has a big impact on how ‘easy’ we find it to bring the arms into this over-head position. One particular joint called the AC joint is often very different in all of us; for some the bony protrusions (particularly the acromion process) is shaped differently to others, seemingly making it ‘impossible’ to get into urdvha dhanurasana with the ‘classic’ arm alignment. It’s controversial and still in debate, but this is likely to be because of the shape of the acromion process, with a ‘curved’ shape being most preventative to raising the arms into the over-head position. When reaching the arms up and back behind the head, keep the arms exactly shoulder distance apart and straight, and wait for the moment when you feel as though there’s something ‘jamming’ the shoulder joint and preventing it from moving backwards any more. If you’ve practiced yoga for a while and have managed to release a lot of muscular ‘tightness’ from the shoulders, then this feeling is likely to be the head of the arm bone impinging on the area of the acromion process. Many actions performed in Yoga classes can cause this to happen if done repetitively, and can lead to irritation of tendons surrounding the shoulder (specifically the rotator cuff) resulting in the all-too-common ‘rotator cuff syndrome’ or even a ligament tear. As Paul Grilley says, when we can’t go any further in a position, it’s extremely important to recognise whether what you’re feeling is due to ‘tension’ (from the muscles) or ‘compression’ (bone-on-bone). When you feel the arm can’t comfortably move backwards any more, draw the arms wider than the chest (bringing the arms out to the sides slightly or ‘abducting’ them), bending the elbows slightly, and then continuing to move the arms back. Here, you’ve moved the head of the humerus (top of the arm bone) so that the joint is no longer restricted, and have created the space you need around the shoulders. If the elbows splay apart or it’s very difficult to bring the hands behind the head, it’s likely you’re dealing with muscular or bony restriction, and the full backbending posture may feel a little more challenging at first. Noticing whether your elbows are splaying out to the sides is also a good reminder for when we approach urdhva dhanurasana: It’s vital to have the arms aligned supportively so that the muscular energy can be most efficiently used to lift the body up without straining ligaments or joints, and the weight can travel easily through the shoulder and arms into the floor. When preparing to enter the posture, if the elbows splay out to the sides, it will put the arms into an unhelpful and potentially damaging rotation. By bringing the elbows over the wrists and aligning the arms similarly to chatturanga, this helps draw the shoulder blades down and onto the back, while allowing the upper back to open up and preventing any shoulder impingement. Keeping the elbows in this position as you rise up into urdhva dhanurasana without splaying them out to the sides requires strength in the upper body, which is important to develop before rushing into the posture. HOWEVER, there’s a huge difference between an un-controlled ‘splaying’ of the arms out to the sides, and a purposeful abduction of the arms and bending of the elbows in order to find a position that allows movement without jamming the shoulder joint. Click THIS link to watch a short clip of Paul Grilley’s anatomy video to see this explained and demonstrated. The shoulders need to find a delicate balance of stability and mobility – mobile enough to allow us to move freely in the upper body and live with relaxed shoulders, but stable enough to support the weight of anything we carry or hold. When moving through shoulder openers, it’s important to listen to your body, and stop if any pain at all occurs. Shoulder opener 1: Interlace the hands behind the back and fold into Uttanasana, allowing the arms to gently drop over. Keep drawing the shoulders away from the ears so that no compression occurs in the upper back or neck. Stay here for 5-10 breaths. Begin with a few rounds of cat / cow to warm and awaken the spine and upper body, and then come into Tadasana (mountain pose) and take a few gentle shoulder-rolls. 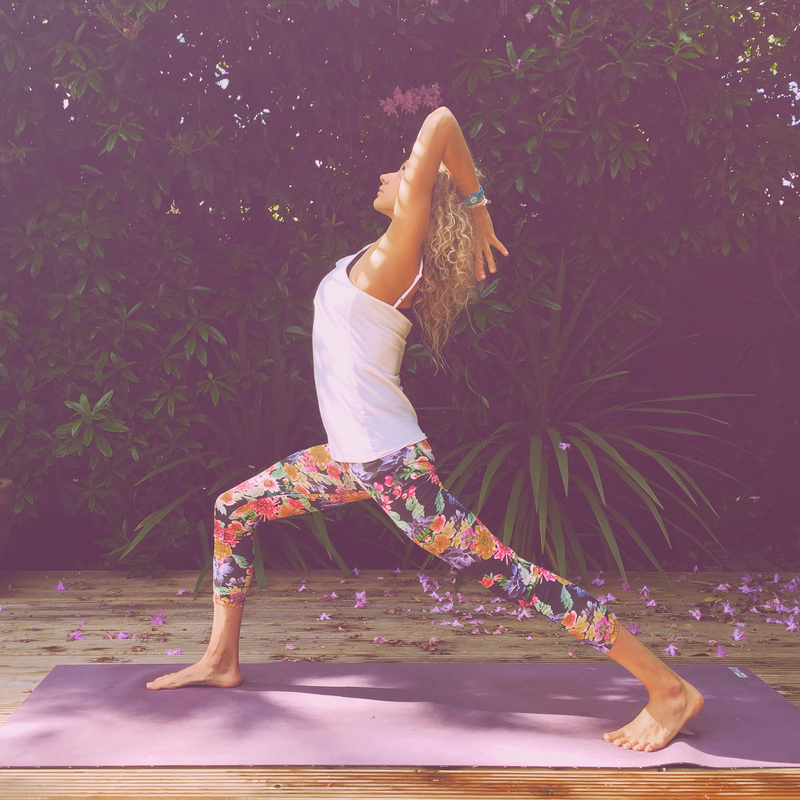 Shoulder opener 2: Garudasana arms: A great position to help release upper-back ‘stiffness’. Reach both arms out in front of you, and wrap the left arm over the right. Bending the elbows, wrap the forearms together and firmly press the palms up and away. Stay here for 5-10 breaths. Shoulder opener 3: Gomukhasana arms. Particularly useful preparation for Urdvha Dhanurasana. Lift the right arm up, bend the elbow and bring the right hand down between the shoulder blades. Either use the other arm to gently hold the elbow in place, or reach the bottom arm behind the back, and interlock the fingers, drawing the top elbow up and the bottom elbow down. Stay here for 5-10 breaths before moving any further. For deeper shoulder openers, check out Juile Martin’s ‘evil shoulder openers’, which I have practiced with her myself, and can definitely guarantee – they’re pretty evil…. From Tadasana (mountain pose) take a big step back with the [left] foot, coming onto the ball of that foot, and bringing the feet and legs hip-distance apart and the hips facing forward. Ensure the front knee is directly over the front ankle, and not splaying in or out. If the lower back feels like it’s compressed here, then take a slight bend through the back knee in order to lengthen the tailbone and bring the pelvis neutral. From a neutral pelvis, then begin to re-straighten the back leg if available, which will also bring a deeper opening into the hip flexors. Remember what we mentioned earlier: Whether it’s difficult to bring the hands into this position, whether it feels as though the shoulders are restricting the movement, or whether the elbows automatically splay out to the sides. These are all clues as to why you may or may not find the upper body positioning of Urdhva Dhanurasana accessible or challenging! Stay here for 5-10 breaths, focussing on lifting the chest forwards and up, while maintaining length throughout the spine. If your elbows splay out to the sides, bring them a little closer together (as long as this causes no pain!) while reaching through them and opening into the armpits. When you’re ready to transition out, bring the palms to the chest, and step both feet together into Tadasana. Take a moment to reflect upon the effects and discoveries of the posture before practicing with the opposite leg stepping back, noticing perhaps subltle differences to each side of the body. To counterpose this asana, bring yourself into Adho Mukha Svanasana to stabilise the shoulders again, and then onto all fours for a few rounds of cat cow. Finish with Baddka Konasana, which will help relieve the legs and hips after the standing posture, and give some gentle flexion to the back and shoulders without completely folding forwards.